One in ten secondary schools in the north east, Yorkshire and the Humber and the east midlands have been “stuck” with a low Ofsted grade for up to 13 years, the watchdog has warned. 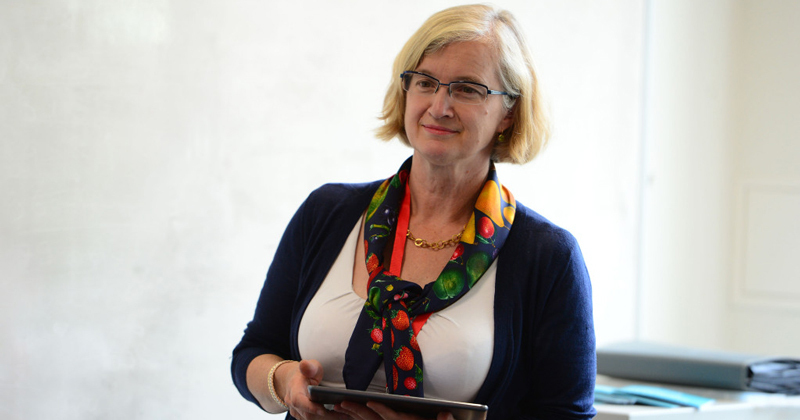 Ofsted’s chief inspector Amanda Spielman first warned of her concerns around “stuck schools” in October, when she revealed in a letter to MPs that there are 490 “intractable schools”, institutions rated ‘requires improvement’, ‘satisfactory’ or ‘inadequate’ at every inspection since 2005. In its annual report, released today, the watchdog warned that two per cent of primary schools and five per cent of secondary schools nationally are considered “stuck”, though the report also reveals massive regional variations. For example, stuck schools make up 10 per cent of all secondary schools in the north east, Yorkshire and the Humber and the east midlands, and seven per cent of secondary schools in the north west. They make up five per cent of secondaries in the West Midlands and east of England, but just three per cent in the south east and south west, and two per cent of those in London. In its report, Ofsted warned that there is a need for “more outstanding schools and school leaders to step up to the challenge of providing system leadership”. “Partly, they are needed to take on and improve on the previous role of LAs in school improvement, some of which were failing the weakest schools and for all of which school improvement funding has been cut. “We need more school leaders to give back to the system by collaborating and supporting struggling local schools, by becoming a system leader or forming a MAT. Ofsted’s analysis found that eight in ten of the 490 stuck schools nationally have moved “back and forth” between the lowest Ofsted grades since 2005, never making it to a ‘good’ rating. 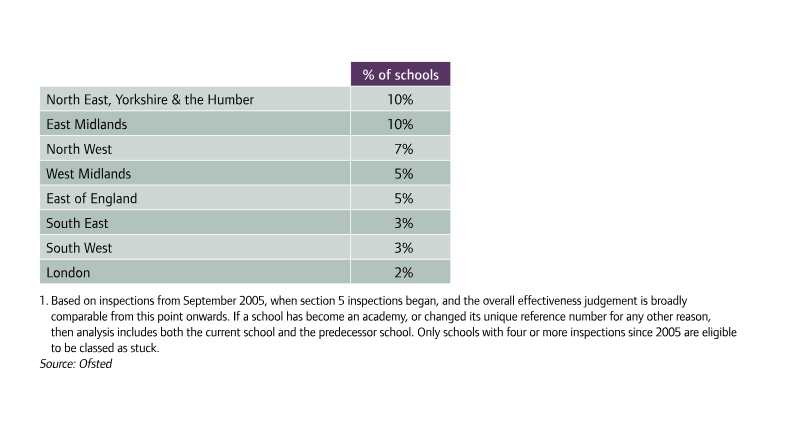 Pupils at these schools made poor progress by the end of key stages 2 and 4. 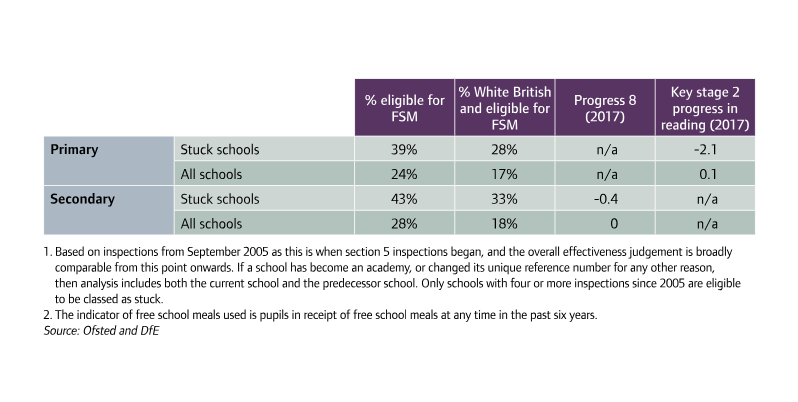 Stuck schools also tend to have an above-average proportion of free school meals-eligible pupils. For example, 38 per cent of pupils at primary schools considered “stuck” and 43 per cent of pupils at secondary schools in the category are eligible for free school meals, compared with 24 per cent and 28 per cent in all primary and secondary schools respectively. Stuck schools are also much more likely to have white British pupils eligible for free school meals, who are among the worst-performing ethnic groups – 28 per cent at primary and 33 per cent at secondary, compared with 17 per cent and 18 per cent respectively across all schools. Ofsted also warned that four in ten of the schools identified as stuck were urged to review the way they use pupil premium funding at at least one inspection in the last three years. These schools are also more likely to be academies and be in multi-academy trusts, “a reflection of the government’s policy to place struggling schools in multi-academy trusts”, Ofsted said. Speaking about stuck schools in October, Spielman said: “That these schools remain poor for so long means that, for some children, in certain areas, there may be no opportunity to attend a good school at any point in their education.